100% Cloud-based solution means you have no expensive infrastructure, installation, setup or maintenance costs. Best of all, you can be up and running iTimeClock in no time at all. Sign in to the iTimeClock Administrators Console via our website to maintain staff records, view and check timesheets and export time records for accounting purposes. Display Staff Time Summary for a given period and see at a glance staff that are clocked in/out. Send staff a reminder email to clock out if they are forgetting to do so. Click on the staff name to view a staff timesheet or click on the report and drill-down icons in the Actions column to list detailed time records. 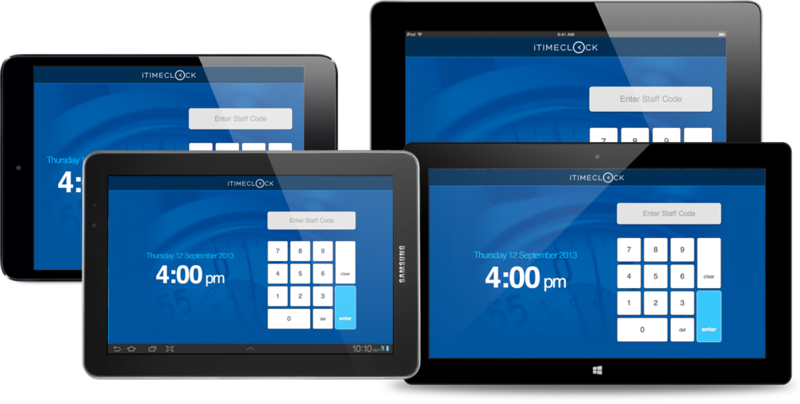 iTimeClock is compatible with most modern tablets including some of the more popular brands from top-tier companies such as Apple (iPad/Mini), Samsung (Galaxy Tab), Microsoft (Windows Surface) and Google (Nexus). 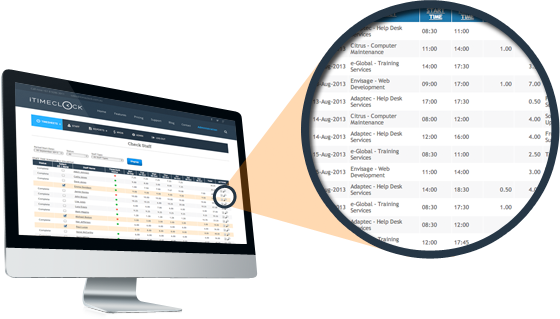 Setup and assign staff to multiple sites/jobs with different cost and charge rates to track and report staff hours and costs. 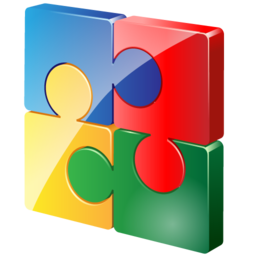 iTimeClock has been developed using Microsoft’s® IIS, ASP and SQL Server database technologies. This means that our product is stable, reliable, secure and scalable. 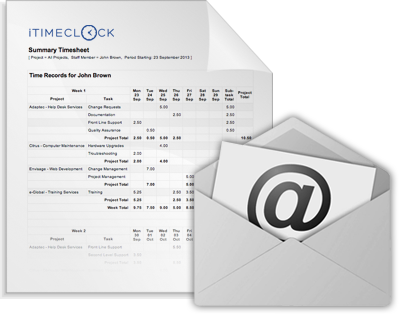 Need hard copy timesheets? 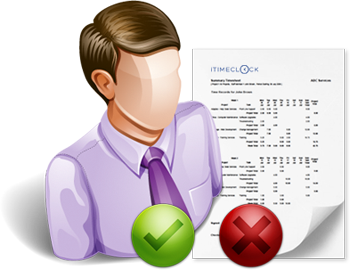 iTimeClock Batch Print feature lets you generate all or selected staff timesheets for a nominated period, complete with electronic signatures, if enabled. Timesheets can also be badged with your organisation’s logo and details (consulting fees apply). 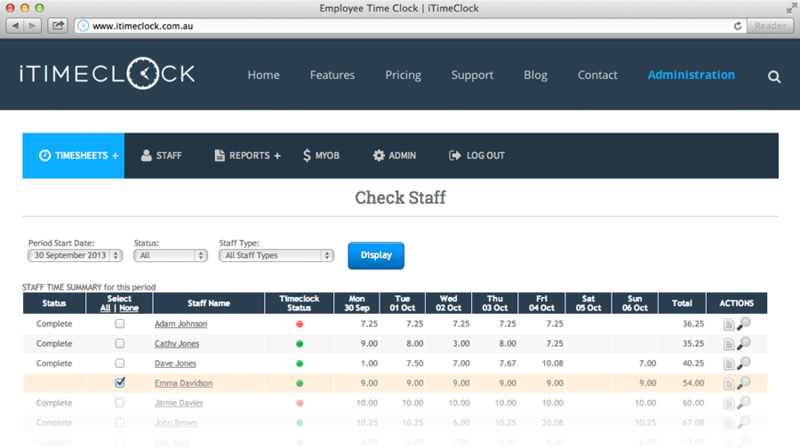 Let managers review and authorise staff timesheets via email or by logging into the administrator console. 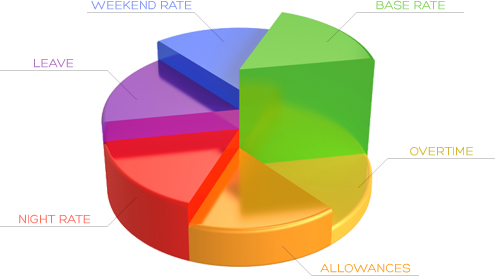 Range of essential reports including staff summary hours, staff cost by week and printing of electronic timesheets. 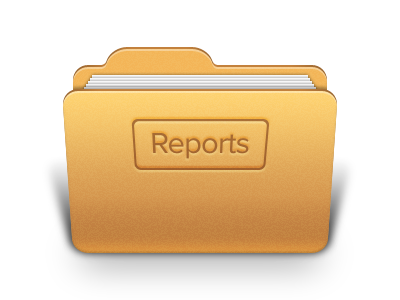 If you have a specific reporting requirement not catered for then we can build it for you and make it instantly available as a Custom Report. Need further detail about data presented on a screen or report? Simply click the drill-down function to view all time and cost records associated with the screen or report item. Our accounting integration modules are designed to automate and streamline the process of exporting time records for generating invoices and processing payroll. These powerful integration modules should significantly reduce your accounting and administrative overheads. For payroll processing, we can incorporate your business rules into our accounting system export enabling the capture of overtime, leave loading and allowances. For comprehensive payroll processing that ensures compliance with complex regulations, awards and contracts we integrate with WageEasy – a cross-industry award interpreter suitable for the retail and hospitality industries. Get product support when you need it, full technical support is available to iTimeClock customers and prospects – when you call you will speak directly to a local-based professional support technician. All our plans include support and version upgrades.